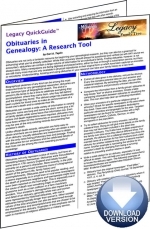 The�Obituaries in Genealogy�Legacy QuickGuide™ contains valuable information on how to interpret the data in obituaries and death notices as well as newspaper articles and other listings. This handy 6-page PDF guide can be used on your computer or mobile device for anytime access. Newspapers can be a goldmine for genealogists. Serving as the gateway to the past, historical newspapers help genealogists learn about the events and perceptions that affected a community. 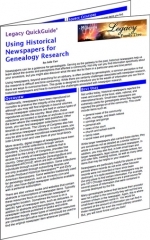 The Using Historical Newspapers for Genealogy Research Legacy QuickGuide™ contains useful information designed as an introduction to the wealth of information to be found in historical newspapers and how to overcome the challenges associated with newspaper research.